Sunday Snapshot: What’s Cuter than an Easter Bonnet? 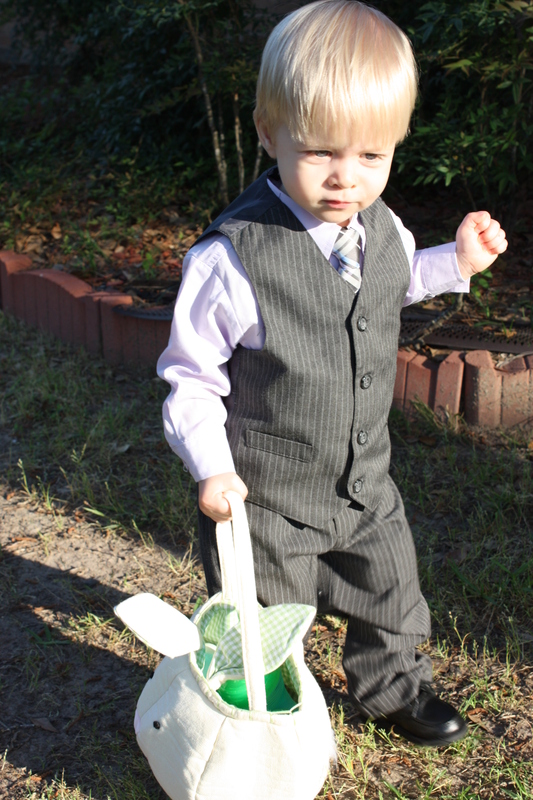 A little boy in his Easter suit, of course! I can take no credit for this photo – Eileen emailed it to me earlier today – but I seriously believe tiny boys in miniature man clothes are the cutest things on earth, so it’s my duty to share James’ adorableness with the world. If you were celebrating today, I hope you had a very happy Easter, and if not, I hope you had a lovely, relaxing Sunday. And if anyone has hard-boiled eggs to get rid of, I’m kind of dying for deviled eggs, so I’d be happy to taken them off your hands. I’m sorry. I do not have any deviled eggs. Oh, I did not mean to suggest someone should devil the eggs for me. I’m happy to do it myself; just looking for leftover eggs. I want to know how Eileen got him to stay still to get into all of that, and how did he stay so clean???? There are several cousins who still could not pull either of those off! Loon,I think it was a quick finger on the lens clicker!!! Dressing up little boys is SO short lived!! Much like D&G on their recent trip to the arboretum, give ’em a tree stump and DIRT and true happiness is ;). I think tomorrow should be “Take Your Child to Work” Day and let the little exec go with Daddy to the office. Eh, Chris? ?